کنعانی, فریده, فضلی, مصطفی, عزتیان, ویکتوریا. (777). برآورد تولید اُزون سطح زمین و دودمِه نورشیمیایی با استفاده از غلظت NOx وO3 در اصفهان. مجله ژئوفیزیک ایران, 10(4), 75-84. فریده کنعانی; مصطفی فضلی; ویکتوریا عزتیان. "برآورد تولید اُزون سطح زمین و دودمِه نورشیمیایی با استفاده از غلظت NOx وO3 در اصفهان". 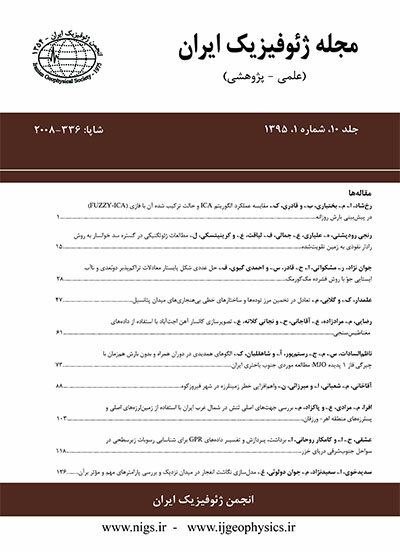 مجله ژئوفیزیک ایران, 10, 4, 777, 75-84. کنعانی, فریده, فضلی, مصطفی, عزتیان, ویکتوریا. (777). 'برآورد تولید اُزون سطح زمین و دودمِه نورشیمیایی با استفاده از غلظت NOx وO3 در اصفهان', مجله ژئوفیزیک ایران, 10(4), pp. 75-84. کنعانی, فریده, فضلی, مصطفی, عزتیان, ویکتوریا. برآورد تولید اُزون سطح زمین و دودمِه نورشیمیایی با استفاده از غلظت NOx وO3 در اصفهان. مجله ژئوفیزیک ایران, 777; 10(4): 75-84. اُزون سطح زمین در طی فرایندهای نورشیمیایی اکسیژن هوا در حضور نور خورشید و NOx به‌عنوان یکی از مهم‌ترین عوامل موثر، تولید می‌شود. در این پژوهش به بررسی اُزون در شهر اصفهان در آذرماه سال 1388 پرداخته شده، که بنابر مشاهدات سازمان هواشناسی، در طی این بازه دودمِه‌ نورشیمیایی بر فراز اصفهان قابل مشاهده بود. همه بررسی‌ها در ساعت‌های تابش آفتاب (15-6 محلی) انجام گرفته است. در این پژوهش با استفاده از روش تقریب حالت پایا رابطه سرعت دیفرانسیل تابعی از سه متغیر NO،NO2 و O3 برای بررسی تغییرات غلظت اُزون به‌دست آمده است. انرژی فعال‌سازی، مرتبه واکنش و سازوکار تشکیل واکنش اُزون در وردسپهر مطالعه و محاسبه شده‌اند . NOو O3 سطح زمین به‌عنوان شاخصی برای تشکیل دودمه نورشیمیایی درنظر گرفته می‌شوند، لذا تولید دودمِه بر مبنای تغییرات غلظت NO وO3 مورد توجه قرار گرفت. بررسی روابط تولید دودمِه برمبنای غلظت‌ها و بررسی براساس زمان، نشان‌دهنده پیروی تولید دودمه از روابط غیرخطی و درجه دوم است. بنا به معادله آهنگ تغییر زمانی اُزون، d[O3]/dt و نتایج انرژی فعال‌سازی می‌توان تولید اُزون را در شهر اصفهان از واکنش‌هایی که دارای سینتیک کلی مرتبه سوم هستند، در نظر گرفت. از طرف دیگر افزایش غلظت NOx در سطح زمین در اثر واکنش‌های نورکافتی (فوتولیز) افزایش غلظت اُزون را سبب گردیده است. B) During 9–12 period: the higher temperature, radiation intensity, and traffic are the effective factors in the emission of pollutants when compared to the other hours of the day. The days under study are classified based on maximum, minimum and average ozone concentration. In order to analyze the tropospheric ozone and smog creation, in this study, the photochemical and semi-empirical models were used. The kinetic and mechanism of a number of photochemical reactions effective in ozone formation were taken into account in order to analyze the changes in ozone concentration. Calculations were carried out by using the Excel and Matlab software programs. Making use of the steady-state approximation method and considering oxygen atom in the steady state, the reaction rates have been computed. The differential relation obtained (d[O3]/dt = k2k1[NO2]- k3[O3][NO]) is a function of three variables of NO, NO2 and O3 concentrations. The amounts of reaction rate (d[O3]/dt) and also the rate constants k2k1 and k3 were also calculated. Analysis of the experimental relation between the activation energy and the results obtained from calculations indicate that the reactions that take place in the troposphere can be considered rank 3 reactions. In the troposphere, the quantum of energy (hν), which is released in some reactions, is very strong. The activation energies obtained for all days of this study include negative values, and this confirms the fact that the energy of the photons of the sun is needed to change NO2 and O2 to O3 in the troposphere. Based on the negative activation energies obtained, we can consider the reaction NO2+O2+ hν→NO+O3 as the mechanism for the tropospheric ozone production in Isfahan. The creation of photochemical smog, SP(t) with t denoting the time, during the mentioned days was studied based on the Jonson’s semi-empirical model. The relations obtained based on the changes in NO and O3 concentrations with respect to time show that smog creation follows a quadratic nonlinear relation. In general, the increase of the concentration of pollutants on the ground as a result of photolysis reactions has led to the production of ozone concentrations. The results achieved from the analysis of reaction rate, smog creation, and the resulting curves indicate that ozone concentration has not been uniformly increasing or decreasing during the studied days, but there were both the increasing and decreasing trends. In general, the photochemical reactions taken place in the atmosphere of Isfahan city have caused both production and loss of ozone. Consequently, the investigation showed that the changes of the ozone concentrations under the effects of the solar radiation followed the same pattern in autumn 2009. On the other hand, the changes in the ozone concentration on the ground level caused changes in smog creation during the studied time. With regard to the above-mentioned arguments and on the basis of the effect of nearly the same conditions, a constant process prevailed. It could be predicted that this pattern will be the same in the future years. غیاث­الدین، م.، 1385، آلودگی هوا، منابع، اثرات و کنترل: انتشارات دانشگاه تهران. Barrett, L. A., Bunce, N. J., and Gillepsie, T. J., 1998, Estimation of tropospheric ozone production using concentrations of hydrocarbons and NOx and a comprehensive hydrocarbon reactivity parameter: J. Photochemistry and Photobiology, 113, 1–8. Brasseor, G., and Solomon, S., 2005, Aeronomy of the Middle Atmosphere: Chemistry and Physics of the Stratosphere and Mesosphere: Springer, 646 pp. Blanchard, C. L., 2000, Ozone process insights from field experiment — Part III: Extent of reaction and ozone formation: Atmospheric Environment, 34, 2035–2043. Chang, T. Y., and Rudy, S. J., 1993, Ozone-precursor relationships: A modelling study of semiempirical relationships: Environ. Sci. Technol., 27, 2213–2219. Chang, T. Y., and Suzio M. J., 1995, Assessing ozone-precursor relations based on a smog production model and ambient data: J. Air Waste Manag. Assoc., 45, 20–28. Daescu, D., 2008, A generalized reaction mechanism for photochemical smog: University of Iowa, Atmospheric Chemistry, 52, 163. Dickerson, R. R., Kondragunta, S., Stenchikov, G., Civerolo, K. L., Doddridge, B. G., and Holben, B. N., 1997, The impact of aerosols on solar ultraviolet radiation and photochemical smog: Science, 278, 827–830. Egorova, T., Zubov, V., Jagovkina, S., and Rozanov, E., 1999, Lightening production of NOx and ozone: Physics and Chemistry of the Earth, Part C: Solar, Terrestrial & Planetary Science, 24, 473–479. Gallardo, L., and Cooray, V., 1996, Could cloud-to-cloud discharges be as effective as cloud-to-ground discharges in producing NOx? : Tellus, 48(B), 641–651. Gracia, I., Rodriguez, J., and Tenorio, Y. M., 2011, Artificial neural network models for prediction of ozone concentrations in Guadalajara, Mexico: Air Quality — Models and Applications, 19, 89–96. Hess, G. D., Carnovale, F., Cope, M. E, and Johnson, M., 1991, The evaluation of some photochemical smog reaction mechanism — I. Temperature and initial composition effects: Atmospheric Environment, 26(A), 625–641. IPCC, 1995, Climate Change 1995, A report of the Intergovernmental Panel on Climate Change, Radiative forcing of climate change: Cambridge University Press, 63 pp. Krishnamurthy, N., Vallinayagam, P., and Madhavan, D., 2014, Engineering Chemistry: PHI Learning, 300 pp. Levine, I. N., 2002, Physical Chemistry: Fifth ed., Vol. 2, Mc-Graw Hill, 986 pp. Özbay, B., Keskin, G. A., Doğruparmak, S. C., and Ayberk, S., 2011, Multivariate methods for ground–level ozone modeling: Atmospheric Research, 102, 57–65. Syri, S., Amann, M., Schöpp, W., and Heyes, C., 2001, Estimating long-term population exposure to ozone in urban areas of Europe: Environmental Pollution, 113, 59–69.